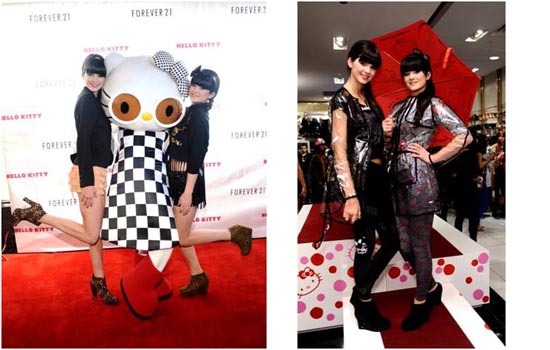 LOS ANGELES, Nov 18, 2011/ FW/ — Forever 21 & Sanrio hosted a launch party for the highly anticipated arrival of Forever 21 for Hello Kitty Collection at the trendy retailer’s Hollywood Blvd location here in Los Angeles. Kendall and Kylie Jenner graced the occasion wearing pieces from the exclusives limited-edition Hello Kitty fashion collection. Fans of Hello Kitty and Forever 21 customers can choose from a wide array of women’s apparel, intimates, hosiery, jewelry and accessories. Priced from $3.80 to just under $30, the limited-edition Forever 21 for Hello Kitty Exclusive Collection is now available in stores nationwide and online.